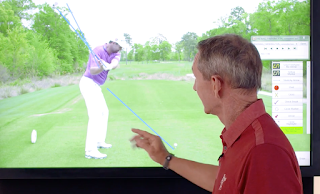 I don't know what made me waste two minutes of my life watching Hank Haney dissect Padraig Harrington's swing but I'm sure glad I did. Because I learned how it's possible for a teacher to say this and that in the swing are "too steep" and "not bad", while at the same time encouraging amateurs to copy it. All credit to finding faults in a really nice positive way! Podge is a three time Major Champion and 2015 PGA Tour winner Hank. No blue lines needed, expect the ones on the cheque!